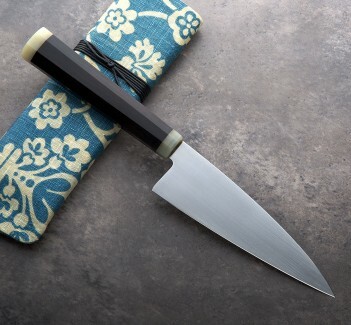 Precision forged and finished with only hand tools, this exceptional XXL Shallot Knife with rainbow quench is not a pattern that Don Carlos Andrade will make again. 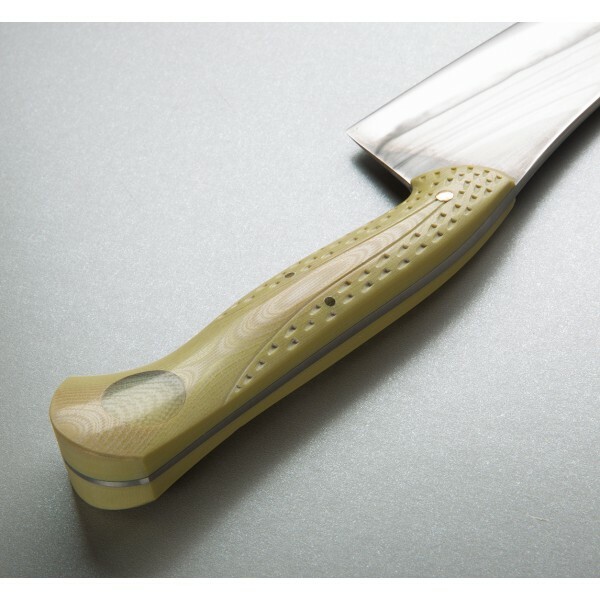 Designed in collaboration with an old friend and chef, Don designed the Shallot Knife, as you might guess, specially for all-day shallot work. Yet as you can see, the possibilities go far beyond shallots. 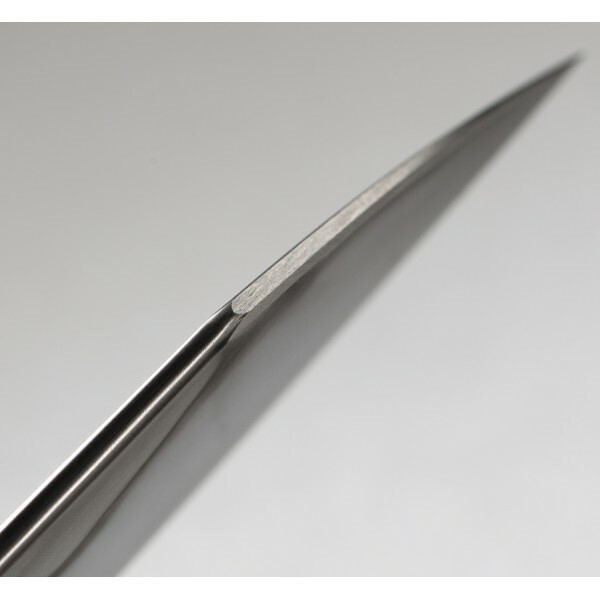 The W2 carbon tool steel blade is tapered perfectly from a wide 3.3" spine at the heel, and is etched and polished after heat treatment to reveal the gorgeous quench lines Don achieves in his carefully calibrated hardening process. 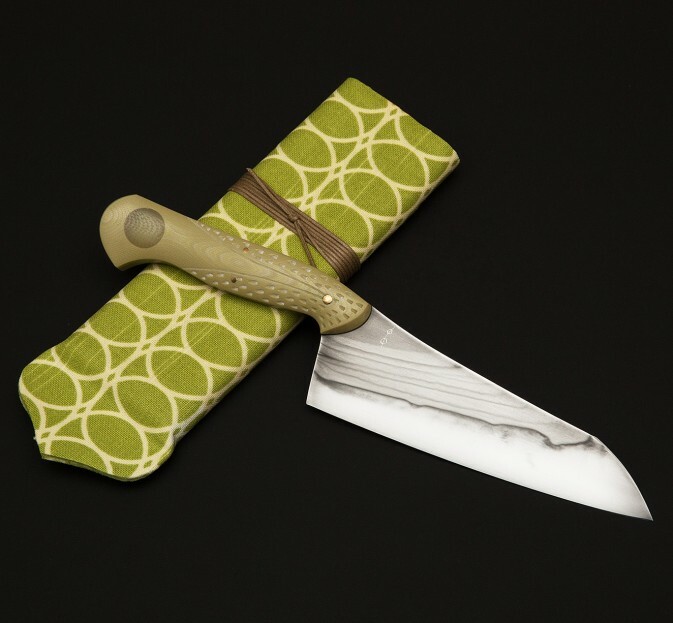 The handle is shaped from the rarest of Westinghouse's infamous micartas, a pale green glass epoxy micarta of which only one sheet was made in each width as rumor has it. 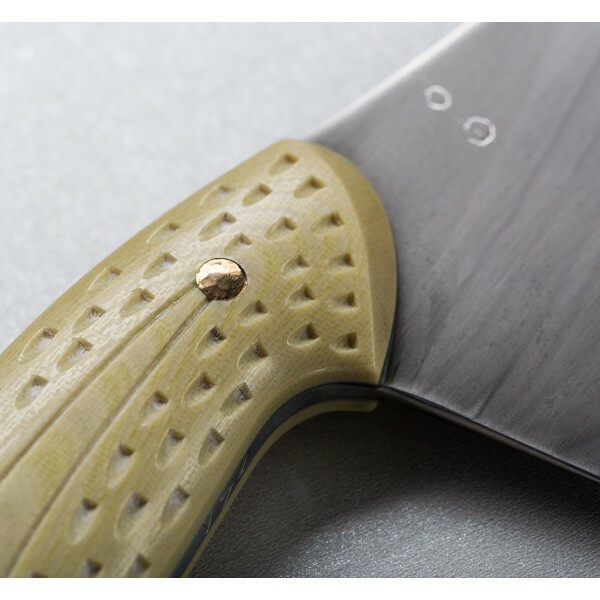 A translucent G10 inlay, detail carving and brass pins tie everything together. Cloth covered transport case is included. 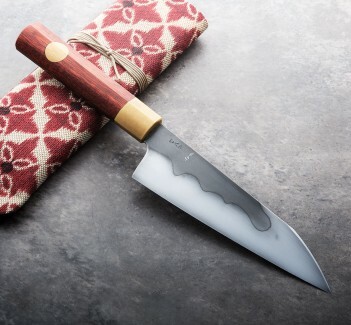 A one-of-a-kind heirloom quality custom chef knife from Don Carlos Andrade, superbly executed, from the W2 blade forged to shape by hand to the detail carvings, peened brass pins and ultra-rare Westinghouse glass epoxy micarta on the handle. Don's two decades in stone and bronze sculpting are clearly seen in the subtle details of his handles. 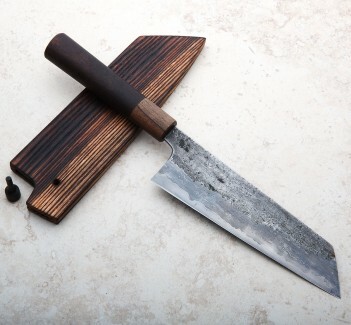 Over 10 years in fine dining kitchens informs his design, balance and geometry, and his skills as a bladesmith, often employing little more than basic hand tools, combine to produce some of the finest handmade kitchen knives in the world today. 6.5" (165 mm) blade, 11.5" overall. 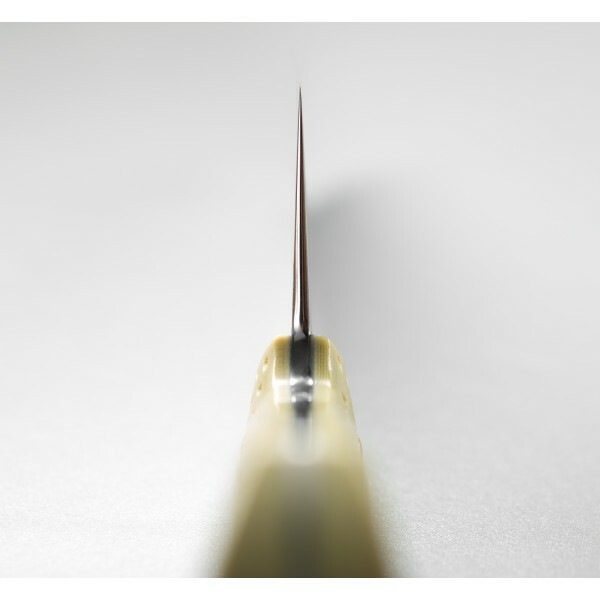 Blade width at the heel: 3.3mm. 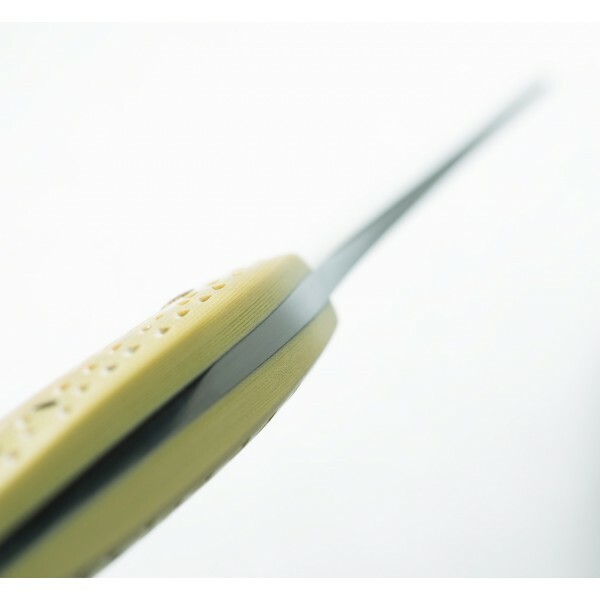 Blade height at heel: 52mm. Weight: 7.6 oz (215 g). W2 carbon steel with differential 'rainbow quench,' etched & polished finish. 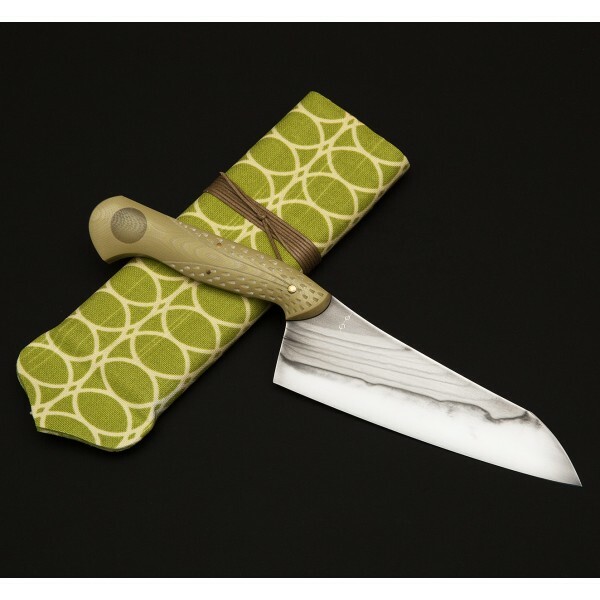 Very rare Westinghouse glass epoxy micarta handle with translucent G10 inlay, detail carving and brass pins.